Hi Folks – It’s November, Christmas is coming, and there’s lots to tell you about! We really value your prayers for this exciting and challenging mission. 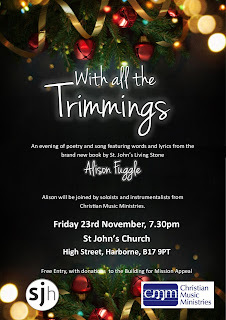 Alison reads extracts from her new Christmas poem book and we sing some of her lyrics set to music by CMM - All welcome! Admission free! - or on an “app” like Simple Radio . If you miss a programme you can “catch-up” on MIXCLOUD . Keep in touch and bless you all!